Be in the know - learn about these topics and more @ your library. Third graders are curious about many things. The library surveyed third graders and their teachers to ask what types of things they are most interested in reading about. The list is long and diverse: the world, outer space, animals, trains, planes, motorcycles, sports and hobbies. Some of the best books on these subjects are available at the library. 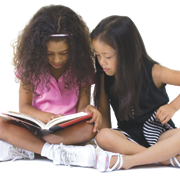 These books will broaden your child's knowledge and understanding of their world. As Dr. Seuss said, "The more that you read, the more things that you will know. The more that you learn, the more places you'll go."